Bowie’s Collection On Display In L.A. The last time David Bowie visited Los Angeles he was in a state of “psychic terror” and his artistic sensibility involved a humanoid alien, an exorcism, a musical masterpiece and cocaine – lots of cocaine. It was 1975 and Bowie was the Thin White Duke, a persona possibly only slightly madder than the musician himself at that time. Four decades later the late rock star has returned and Americans can once again behold unfamiliar, eclectic British talent, except this time Bowie’s role is that of collector, not creator, and the vibe is corporate, not spooky. Dozens of paintings, sculptures and pieces of design from Bowie’s extensive art collection will go on display in LA on Tuesday, part of a global tour before Sotheby’s auctions the entire collection in London in November. 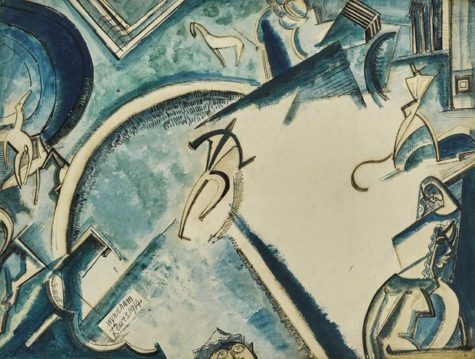 Among the works: Wyndham Lewis’s 1913-14 work, “Circus Scene” (pictured). Bowie Auditioned For “Lord Of The Rings”?